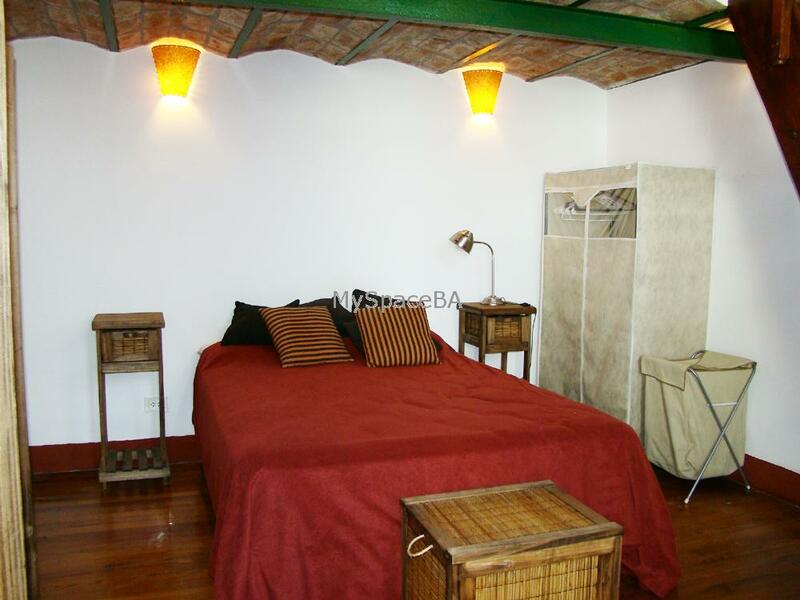 Quiet and comfortable 2 bedroom apartment located in the bohemian neigborhood of San Telmo. This apartment is fully furnished with a conservated antique style and is warm decorated with detaisl in wood. On the first level, you will find the living area and the dinnig area in the same wide room, it offers sofas, a coffee table, a tv, a music player, and a dinning table in wood for two people. The bedroom is next to the living and dinning area. It has a queen size bed, closet and some furnitures in wood. Upstairs, on the upper level is the second bedroom which has a comfortable bed sofa with a queen size mattress. This room has a way out to a small yard. The bathroom which is complete with bathtub and shower is in the lower floor as the kitchen, totally equipped. This is a very ample apartment if you need an apartment for 4 people. Music player, TV, queen size bed, totally furnished, totally equiped kitchen and bathroom with bathtub and shower.